For the first time in the history, EU countries are all confronted with immigration and – to a different extent – with integration challenges. The economic integration of immigrants is crucial for several reasons. Increasing migrants’ employment supports social cohesion mechanisms by diminishing the risk they use the welfare state more than the local population. Moreover, when complementary, migrants do contribute to national economic growth. At an individual level, economic integration increases their well-being and facilitates social integration in the hosting society. Integration patterns do show a high degree of heterogeneity in Europe. Both magnitude and profiles of immigrant people largely differ between and within countries, and this largely affects such variability. Among others, gender, origin, reason for migration, human and social capital resources play a key role in conditioning integration trajectories. At the destination end, admission and integration policies are important predictors. By looking at the employment and income dynamics, we look at if and how migrants do integrate into EU labor markets in 2014, using native people as control groups. To this aim, we use the EU-LFS dataset while focusing on the prime working age (25-54). Like previous studies, we focus on a restricted number of variables – gender, origin, and destination – which allows for detecting evidence within a comparative perspective. Unlike most previous research, we look at integration outputs both between and within countries. 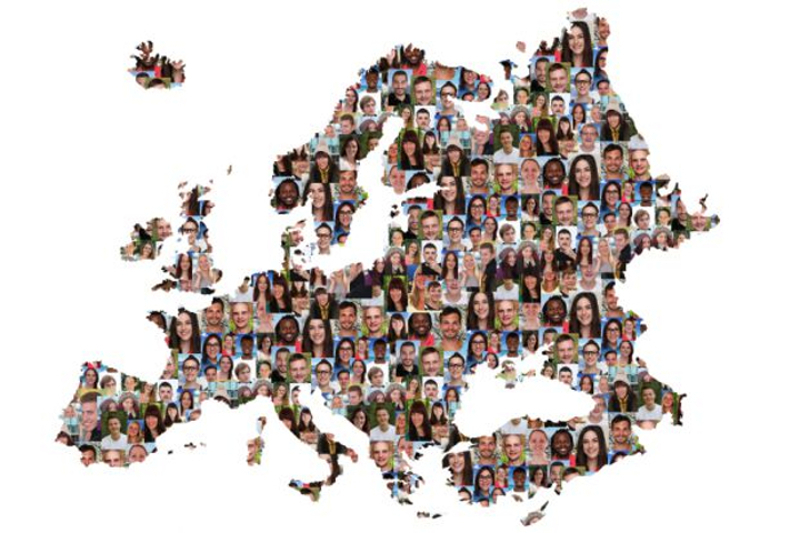 Overall, the average performance of EU migrants in terms of employment and income are very close to that of the local population suggesting that this group is positively selected and mainly composed of highly skilled individuals. Unlike EU migrants’ performances, economic integration of third-country nationals reflects a high degree of heterogeneity across European countries reflecting cross-country differences in national labour market structures, admission policies, discrimination patterns, and migration histories (Figure 1). In an attempt of tracing commonalities and dissimilarities in employment outcomes, three ‘integration groups’ seem to coexist today in the EU. First, the ‘southern European countries’ group – composed of Greece, Italy, Portugal, and Spain – is characterized by overall low employment rates as well as low differentials between third-country nationals and local residents. Second, the ‘north-western EU countries’ – which include longstanding EU immigration countries (Austria, Belgium, Luxembourg, the Netherlands, Germany, France, and the United Kingdom) and Scandinavian countries (Sweden, Finland, and Denmark) – is instead characterized by very large differentials. Third, the ‘new EU accession countries’ group – composed of Bulgaria, Cyprus, Croatia, Czech Republic, Estonia, Latvia, Lithuania, Hungary, Malta, Romania, Poland, Slovenia, and Slovakia – presents minimal employment-rate differences. As far as income performances are concerned, third-country nationals are dramatically more likely to be concentrated in the bottom decile of income distribution than local residents, while very few migrants are found in the top income decile distribution compared with the host population. In addition, a clear trade-off between the employment-income dimensions is observed in our cross-country analysis: better employment outcomes are counterbalanced by poor economic conditions in terms of income. Migrants show a low (negative) difference in employment compared with the local population in countries where they are at the bottom of the income distribution and vice versa. Being a woman born out of the European Union appears being the major discriminant in negatively affecting economic integration outcomes, regardless of destination (Figure 2). Female employability differentials of third-country nationals are much higher than male ones in all countries and, especially, in some longstanding and Scandinavian countries of immigration – Belgium, Germany, the Netherlands, Denmark, and Sweden – where the gaps between third-country nationals and local women’s employment rates exceed -25 percentage points. This probably reflects the fact that women have reached northern and western Europe mainly through family reunification and asylum-seeking schemes rather than as economic migrants. In terms of income, in almost all groups of countries women’s presence in the bottom income decile is significantly higher than that of their local counterparts and even greater than migrant men. When controlling for age and education, the situation does not vary significantly. This suggests that differences in composition do not play a major role in explaining income probability gaps. Other determinants, such as insufficient human capital and knowledge of the destination language favour employment with low upward professional mobility, which justify why differentials in income persist over time, especially for woman. Overall, data confirm a high level of heterogeneity among European regions. This is not surprising as immigrants’ integration takes place in practice at a local level rather than at a national one. Our results clearly show different models of economic incorporation for EU migrants and third-country nationals. 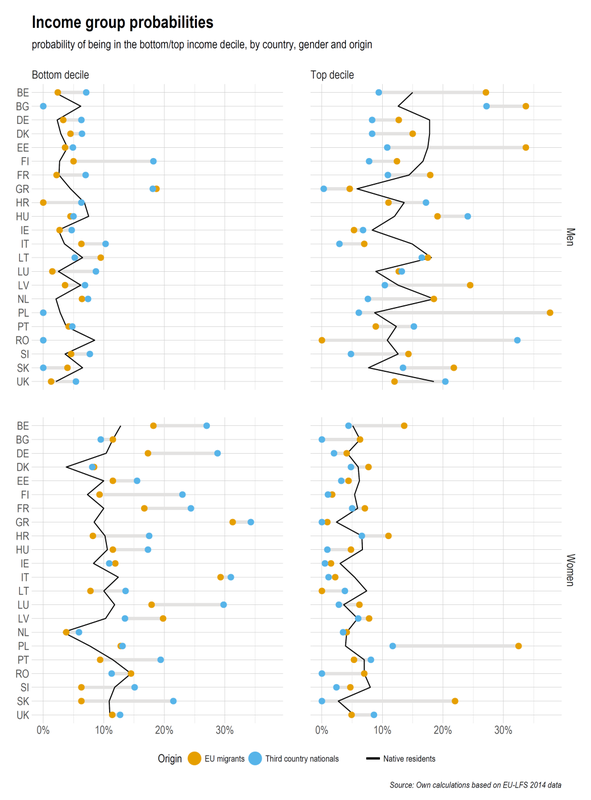 EU migrants are more mobile, with migration trajectories driven by job opportunities. Third-country nationals appear to be a more homogenous group in terms of skills, are less mobile, and are concentrated in places that offer fewer job opportunities. It appears to be confirmed as the regions are still crucial nodes for the shaping of immigrant integration everywhere in Europe with two main consequences. On the one hand, local interventions could create differences in opportunities and incentives among regions, large and small cities, and urban and rural zones. On the other hand, the engagement of actors of this kind could result in more tailored interventions in accordance with local needs and priorities. In so doing, local actors can also address specific territorial needs and counterbalance the shortcomings of national and supranational policies. Giving priority to tailored integration policies to favor third-country nationals employment, also at the regional level. In addition the low employment of women calls for more gender-oriented policy actions that take into account the channels of entrance to tailor the integration policies to foster their labor market integration. 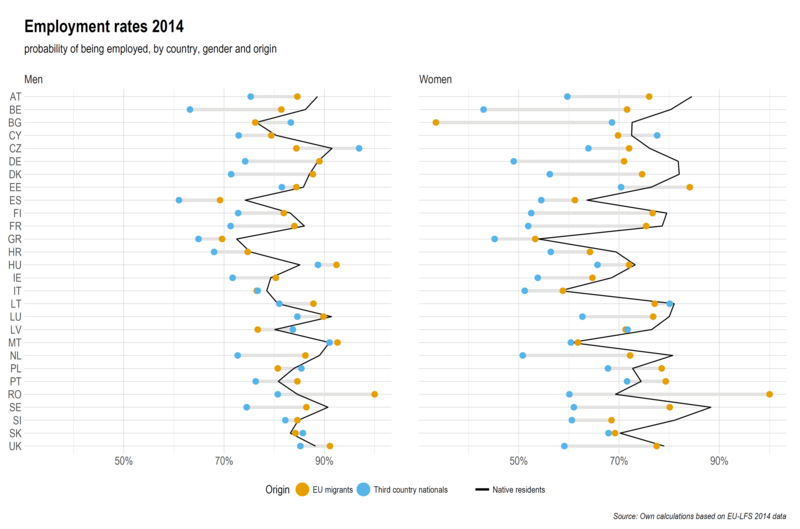 Integrating EU migrants is less problematic even if more present among women. More data are needed at regional level, where integration occurs!